There’s something about Thai women, MAN. Aaron Ramsey was recovering from surgery to mend an horrific double leg break as Arsene Wenger claimed that his new generation of Arsenal stars are in danger of being 'destroyed'. Ramsey was taken to hospital on Saturday night following a second-half challenge from Stoke's Ryan Shawcross that shattered the tibia and fibula in his right leg. The 19-year-old Wales midfielder had a corrective operation to stabilise the leg and pin the bones back together, and was kept in overnight before travelling back to London with Arsenal's team doctor Gary O'Driscoll on Sunday. Although the early indications are that Ramsey will be out for up to eight months, the break is higher up his leg than a similar injury suffered two years ago by team-mate Eduardo, who had the added complication of a dislocated ankle. Stoke put out a statement from Shawcross, conscious of the criticism Birmingham incurred when they failed to react to Martin Taylor's challenge on Eduardo. It stopped short of an apology, with Stoke and their player adamant that his attempt to win the ball in the 66th minute was mistimed rather than malicious, even though referee Peter Walton gave him a red card. 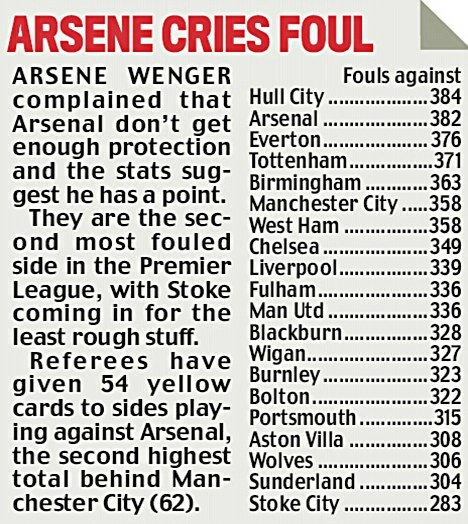 Replays appear to support their case, but that will be of little consolation to Wenger. Two years ago the Arsenal boss had called for Taylor to be kicked out of football before quickly retracting his comments. He was more restrained on Saturday but could still not hide his anger after Ramsey joined Eduardo and Abou Diaby on the Arsenal list of players who have had bad breaks. Wenger said: 'Today in midfield we had Nasri, Fabregas, Ramsey, Eboue – an average age of 21. Up front, Bendtner is 20 years old. What these guys do, at that age, is remarkable. To handle the game like they handle it. But of course if you destroy them, they might not be football players. 'What is most terrible for me is that Ramsey starts his career with a double operation and you never know what kind of consequences this will have on his physical side of the game and his psychological side of the game. It's just scandalous. Shawcross left the pitch in tears and was driven home by his mother. The incident overshadowed his first senior England call-up, and in his statement he insisted: 'There was absolutely no malice in the challenge. I would never, ever go out to hurt a fellow professional. Danny Pugh put Stoke ahead and Nicklas Bendtner equalised before Ramsey's injury. Late goals by Cesc Fabregas, from the spot, and Thomas Vermaelen secured the win. Wenger, whose side trail Chelsea by three points, believes Ramsey's setback could be the making of them. 'It will be tight to the end but it gives us one more reason to be strong, united and to fight until the finish to do it for Aaron,' he said.